“Don’t be afraid to ask your fishmonger for help and advice” says Ben Hardy, sous chef of Q restaurant in Fowey. Rub oil over the pepper and roast in a hot oven (170ºc) for 10 minutes until it starts to soften. Allow to cool, then deseed, peel, and cut into thin strips. Cut the squid in half, length ways, and score in a crisscross on the inside, cut the tentacles into single pieces. 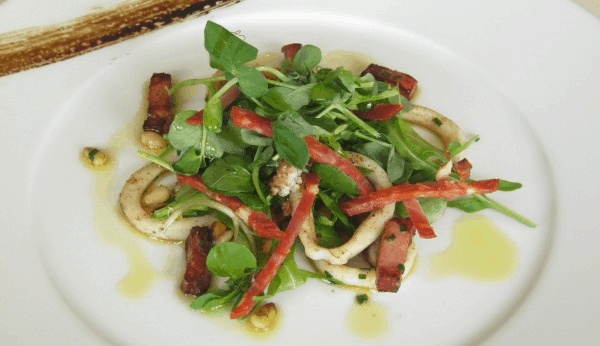 In a hot pan, drizzle a little oil and fry the squid and chorizo for 1-2 minutes, add the peppers and pine nuts and warm through for 30 secs. Remove the ingredients from the pan with a slotted spoon reserving the oil. Add the balsamic and remaining olive oil to the pan and season with salt and pepper to taste. Toss all the ingredients except the olive oil and balsamic through the mixed leaves. Serve in a bowl and spoon over the dressing. There’s certainly plenty of fish and seafood to be found in the waters off Fowey. We source ours from Fowey Fish just across the road. Every morning, the fishing boat trawls the bay looking for its seasonal catch, never failing to bring back an exciting variety of local seafood. We use only local, fresh produce and a touch of chef’s magic to create mouth-watering delicious meals. We’re serving this vibrant dish in our restaurant right now. Our recipe is so quick and easy, why not try cooking it yourself at home? Fancy taking on this kitchen challenge? Share photos of your creation with us on our facebook page.